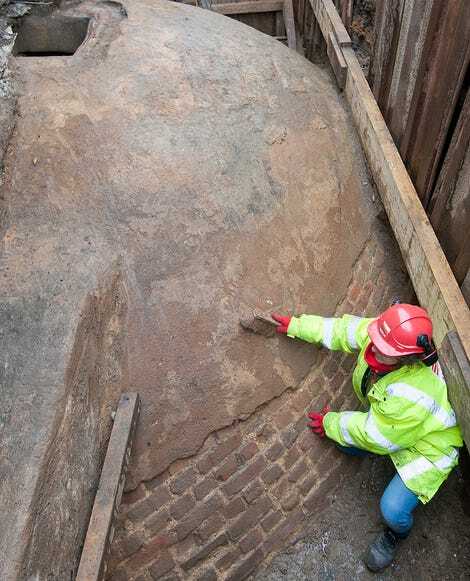 Archaeologists in London have re-discovered a subterranean ice house near Regent’s Park. Dating back to the 1780s, the egg-shaped cavern was used to store ice, which was imported from as far away as Norway. Made from brick, the structure would have been one of the largest of its kind at the time, according to the Museum of London Archaeology (MOLA). The egg-shaped chamber measures 25 feet (7.5 metres) wide and 31 feet (9.5 metres) deep. 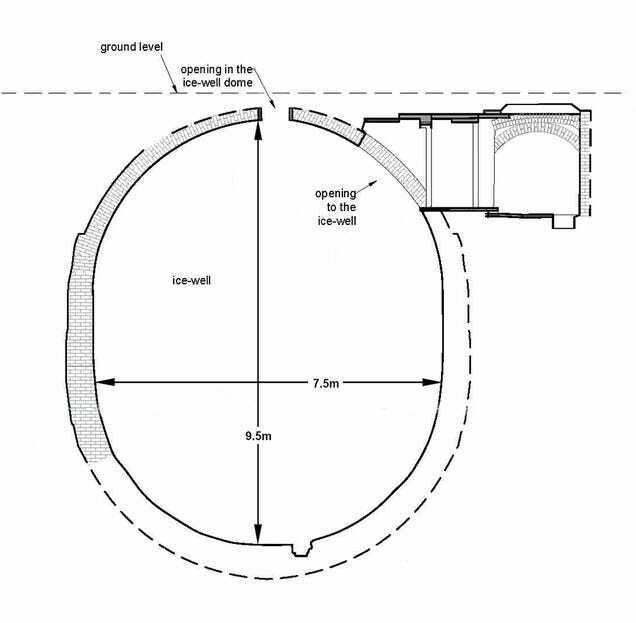 Archaeologists with MOLA found the ice house, also known as an ice well, along with its entrance chamber and vaulted ante-chamber, during preparations for the development of the Regent’s Crescent residential project. MOLA said the ice house is in remarkable condition, given that buildings directly above it were destroyed during the London Blitz of the Second World War, and that a subway line runs about 32 feet (10 metres) underneath, as the Guardian reports. It’s hard to believe that a structure as large as this could have gone missing, but the entrance was buried during clean-up operations after the Blitz. MOLA is working at the site on behalf of Great Marlborough Estates, which is currently redeveloping Regent’s Crescent, which once boasted elaborate stucco terraces designed by architect John Nash, who also designed Buckingham Palace. The ice well was built underneath the terraces in the 1780s by Samuel Dash, who had ties to the brewing industry. By the 1820s, ice-merchant and confectioner William Leftwich was using the Ice House to store and supply ice for wealthy Londoners, according to MOLA. While modern refrigeration had yet to be invented, that didn’t deter Englanders from wanting easy access to ice. It wasn’t possible back then to create ice artificially, so it had to be gathered from local waterways and stored in subterranean ice houses, of which there were thousands in London alone (though much smaller than the newly discovered ice house). 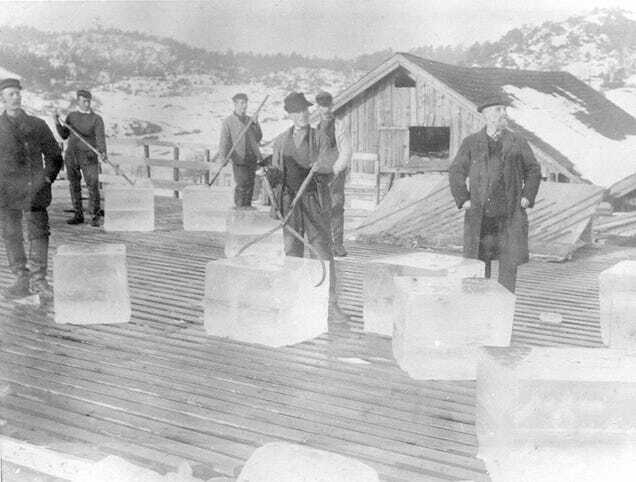 As the Guardian reports, workers at the ice house would descend into the chamber to collect pieces of ice when needed. The ice would have been delivered to customers, including restaurants and potentially doctors and dentists, via a horse-drawn cart. Leftwich was one of first people to recognise the potential for profit in imported ice: in 1822, following a very mild winter, he chartered a vessel to make the 2000km round trip from Great Yarmouth to Norway to collect 300 tonnes of ice harvested from crystal-clear frozen lakes, an example of “the extraordinary the lengths gone to at this time to serve up luxury fashionable frozen treats and furnish food traders and retailers with ice” (as put by David Sorapure, our Head of Built Heritage). The venture was not without risk: previous imports had been lost at sea, or melted whilst baffled customs officials dithered over how to tax such novel cargo. The newly re-discovered ice house has now been designated a Scheduled Monument by Historic England. Restoration work is planned for the structure, along with the construction of a viewing corridor to allow public access.